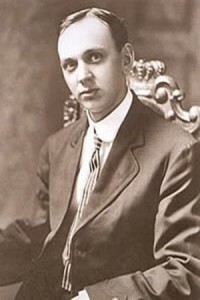 Edgar Cayce had many strange abilities. One was discovered when he was a young child and could’t remember how to spell the words he was learning at school. After struggling to memorise the spelling with his father’s help he said, “Daddy, please let me sleep. I’m so tired.” By chance the book he had been learning from was under his head as he slept. When Edgar woke and his father continued with the lesson, they found that Edgar knew how to spell every word perfectly. In some way his mind had looked into the book as he slept and photographed each word. When he knew his sleeping mind could do this he used it to learn his other school lessons. He found it easy, when asked, to stand up and recite a long, famous political speech! Like some other children, Edgar also claimed to see people who were not visible to adults. Psychologists often explain this as an ‘imaginary playmate’, but Edgar claimed one of these people was his dead grandfather. Another unusual ability appeared when Edgar was accidentally hit on the head by a baseball. Just before becoming unconscious he described a poultice that should be put on his head. The poultice was made and applied, and helped Edgar’s healing. Realising just how extraordinary Edgar’s abilities were, his parents never mentioned them to people outside the family in case they thought Edgar was mentally peculiar. When he grew up, Edgar consciously used his capacity to look into things with his mind and prescribe something to cure people’s illness. This came about because at one time stress caused Edgar to lose his voice. In trying to find a cure he consulted a hypnotist named Hart. Hart failed to put Edgar into a hypnotic sleep, but Edgar knew he could do this himself. Working with another man, a hypnotist named Layne, Edgar was able to put himself into a sleeping state, look into his own body, and describe what needed to be done. While in the self-induced sleep he said it should be suggested to him that the circulation to his throat should increase. This was done and his throat became scarlet with blood. Gradually this decreased to normal, he was told to wake, and he had regained his voice. When local doctors heard of Edgar’s ability they started asking him to help them with difficult cases. Gradually his fame spread. In August of 1902, Edgar was called to the house of Mr. and Mrs. Dietrich of Hopkinsville, USA Their five year old daughter Aime had been ill for three years. After an attack of flu at the age of two, she had stopped developing mentally and was experiencing frequent convulsions, up to twenty a day. The Dietrich’s were quite wealthy and had tried many specialists, with no avail. It must have been desperation that urged them to ask a young, rather shy book-shop assistant to see if he could help their only daughter. Cayce explained to them that he was not a doctor and knew nothing of medicine, or why the child had convulsions. The Dietrich’s said they understood this, but urged him to continue. Loosening his shoes and tie, Edgar reclined on their sofa and put himself to sleep. Standing nearby, Layne, began to ask him questions about Aime. Remaining asleep, Edgar answered in a clear voice and in great detail. While asleep, he had explained that a few days before catching flu, Aime had slipped and hit the end of her spine, displacing one of her vertebrae. The flu germs had been able to enter the spine. But Edgar had said that osteopathic adjustments to the vertebrae would cure her. After the feature appeared in the New York Times people began to request Edgar’s help from all over the world. Distance did not seem to be a problem. He would go into his self induced sleep state and his wife, Gertrude, would ask him to examine the person who had asked for help. From his sleep state he would describe in medical terms what was wrong in their body and mind, and suggest ways they could find healing. While awake, Edgar was a poorly educated man who for many years worked as a photographer. He became so sought after though, that an organisation was formed to support his work, and a hospital was built in which several doctors worked under Edgar’s supervision. Gradually people began asking the sleeping Edgar questions regarding other things than their health. This was partly because in some ‘health readings’ he mentioned that the person’s present illness or life situation linked with what had happened in a previous life. While awake Edgar did not believe in reincarnation, but his sleeping mind saw it as part of the wider scheme of a person’s experience. One man who sought what were called ‘life readings’ – which meant a description of past lives – was Dave Kahn. From his sleep state Edgar told Dave that he had been an Irishman, and worked as an aide to Lord Howe, a famous English soldier. Edgar went on to say that General Somerville of the American forces was in fact the reincarnation of Lord Howe, and if Dave would go to him, General Somerville without knowing why would take him on as an aide. Dave Kahn did get an introduction to General Somerville, and was taken on as an aide. Because of other past life influences, Dave was also advised to go into the wood and metal business. Needless to say, he did. He became a millionaire through the results. One night, when Edgar and his Gertrude were just going to bed, there was a knock on the front door. Edgar went, and Gertrude heard him talking for about an hour. When he came back to bed, she asked him who it was. The strange reply was that it was a friend they had known some time ago. She had died, and had come to Edgar to help her understand her situation. This was not an unusual event for him. He taught that when we are born we have died to another ‘spiritual’ existence. Then when we die in this life, we are born back into that other life. Just as in this life our body forms from what we drink, eat and feel, so in the life after death we form our ourselves out of all we have experienced, thought and felt during our physical life. Edgar’s life demonstrated the extraordinary nature of the human mind day after day. At times while asleep he spoke foreign languages he had never learned – actually holding a conversation with someone seeking a reading. His awareness could reach across space and see a place he had never been. For instance once, after giving a health reading and suggesting a particular medicine called ‘oil of smoke’ the medicine could not be found in any pharmacy. During another reading Edgar gave the name and address of pharmacist in Louisville, a great distance away. The owner of the pharmacy said he didn’t know of the medicine, and didn’t have any. So Edgar took yet another reading and described a shelf in the pharmacy and said the medicine was old stock that had got pushed to the back. The owner looked where Edgar had suggested and found the medicine. Of course, because Edgar’s sleeping mind would respond to any question, people asked how he could gather such amazing information, and if through training they could do likewise. His reply to this was that what we are aware of while awake is only a tiny part of our total awareness. Parts of our mind usually unconscious link us with all other minds – in fact we are linked with all history. So when Edgar put himself to sleep, he was able to touch millions of minds and gather what was relevant to the question being asked. He said that we are all capable of this, but of many of us it is difficult to bring to awareness what we know unconsciously. Edgar left us a lot to learn. Edgar Cayce’s life demonstrated that the mind is much vaster than we usually believe. Although our own personal memories and skills may be limited to what we have experienced and learnt, Edgar showed that if we go beyond the edge of our own mind, if we open to what is bigger and older than our personal mind, it is possible to know what is happening deep inside another person’s body; to see or know what is happening at a distance; speak languages you have not learnt; know the ancient events in which this present life has its roots; have an experience of being part of a vast life and awareness. Edgar taught that most of us lack his easy access to this cosmic mind. But he said that dreams are a link with it because during sleep we merge with the cosmic mind. Therefore a dream is sometimes like a message from this vast mind about our life and actions. Edgar said that if we try to understand and use what we find in our dreams, the wall between our waking self and cosmic self will get smaller, allowing us to lead a life that is not separated from this great ocean of life and mind. Edgar also taught that we need to frequently remember our connection with our larger self. To do this we need to learn how to listen and to be quiet. This form of quietness or listening is sometimes called meditation or prayer. But if we call it prayer it doesn’t mean simply repeating words that someone else has written about the cosmic mind. We need to listen ourselves to see what our relationship with it is. A simple way of using the power of your dreams it to start writing them down. Make a dream diary. It is then easier to look back to see if you have dreamt about the same things in the past. Think of everything in your dream as being magical. This means that even stones can speak and are alive in some way. Certainly any animals or other people in your dreams have a lot to teach you and can become friends, even if at first they may appear frightening. If you do have frightening dreams, make a model of the dream or draw a picture of it. But think of it like a film script, one you can change and carry the plot on past where it ended. So the frightening thing in the dream can be put in a cage for instance, until you have tamed it or made friends with it. Our bigger mind speaks to us in much the same way as our ordinary memories come to us. Most of us however, have made something like tapes or recordings in our mind. So when we think, or try to get a new idea, we are often simply replaying something we read or heard or felt in the past. Listening is a way of quietening these tapes so something new can come to us. This is often called intuition, knowing something without someone else telling us or experiencing it through our senses. So when Edgar examined someone’s body while they were many miles away he was using intuition. You can practice listening almost anywhere or at any time. Start by remembering your links with the rest of life. Remember that without food – the bodies of other living things – you could not exist. You need the air and the sun. The clothes you wear and the house you live in were made by other people. So your life is a part of a huge network of connections with other people and with life. Having remembered that, see if you can create the feeling inside you of being receptive like an empty cup. An empty cup makes no effort. You do not need to struggle or try to be good or powerful. Life touches everything and everyone, so open to it. Remember your connection with everything and open to it to see if you are missing something, or can learn something. Hold that feeling for a few minutes then get on with your everyday life. If the larger mind has something important to communicate, you will find ideas and feeling trickling into your mind. readers interested about everything’ve written. Just my opinion, it might bring your posts a little bit more interesting.